As a caisse member, you can apply to be elected as a director, express your point of view by participating in the annual general meeting and elect the people who will represent you on the board of directors. Members of Caisse Desjardins du Vieux-Longueuil are invited to the caisse's Annual General Meeting. See the notice of meeting (in French only, PDF, 134 KB) - This link will open in a new window..
Light refreshments will be served after the meeting. Parking is free. The caisse is inviting members to actively take part in its democratic life. A call for nominations has been made to fill openings on the Board of Directors. The 2019 call for nominations has ended. Thanks to all candidates! See the call for nominations (in French only, PDF, 204 KB) - This link will open in a new window..
To learn more about the roles and responsibilities of directors, see the Information kit for director candidates (PDF, 686 KB) - This link will open in a new window.. Through the Annual General Meeting, your caisse calls on you. It gives you the opportunity to participate in a variety of consultations such as how surplus earnings should be allocated. It also gives you the opportunity to exercise your right to vote to adopt or amend caisse by-laws and elect the directors who sit on the Board of Directors. 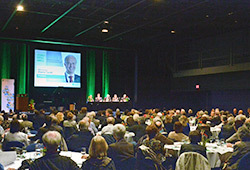 The last Annual General Meeting of the Caisse Desjardins du Vieux-Longueuil was held on April 23, 2013, and was attended by 220 people. The caisse's balance sheet and financial results were presented to members. The Board of Directors reported to the annual meeting. Elections were also held at this meeting. For details, see caisse financial results. 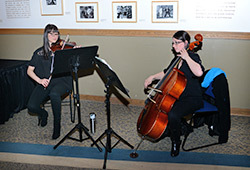 Émilie Livernois-Desroches (violin) and Ariane Lamoureux-Ouellette (cello) greeted members with a musical performance. Marie-Pier Allard and Anthony Fortin delivered an original performance to our members. The duo had also performed at the 2012 edition of Les Mardis des Jardins. 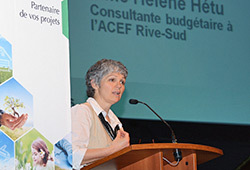 Hélène Hétu, budget consultant at the Association coopérative d'économie familiale Rive-Sud, talked about the importance of Desjardins Mutual Assistance Funds, a micro-credit program offered to those in need. For a fifth consecutive year, the Caisse awarded many scholarships to its young student members, totalling $10,000. 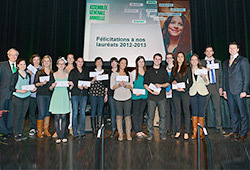 Winners of the 2012-2013 Caisse Desjardins de Longueuil scholarship program: Lauréats 2012-2013 (in French only, PDF, 455 KB). For more information, see the press release: Communiqué de presse (in French only, PDF, 189 KB). Caisse Desjardins du Vieux-Longueuil is pleased to account for the administration of your financial services cooperative in 2018. The annual report (PDF, 112 KB) - This link will open in a new window. 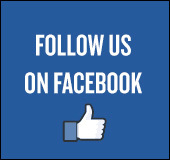 contains information about the financial results and activities of your Caisse in the past year. View the caisse financial report (PDF, 204 KB) - This link will open in a new window..
See the 2018 year in review: Revue de l'année 2018 (in French only, PDF, 951 KB) - This link will open in a new window.